Iberostar Varadero Hotel Reservations. Call 020 7962 9933. Sun, salsa and fin-tailed cars... Take in the very best of Cuba with this 10 night, 5 star twin centre in this fascinating and vibrant country. 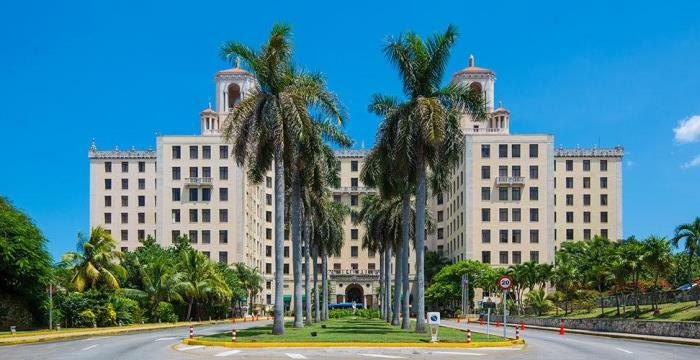 Begin with 3 nights at the privileged spot of the Santa Isabel, with Havana's many landmarks a mere stroll away. Sat on the Plaza de Armas, you'll be in the perfect place to explore the colourful, cobblestone streets. Next, enjoy a 7 night, all inclusive stay cradled in paradise at the stunning Royal Hicacos Resort and Spa. This adult-only resort serves up a real taste of luxury, mere steps from the pristine sands of Varadero beach. Be sure to make the most of the Diamond Club with a 20% discount on spa treatments. With all the charm of a colonial-style mansion, the Hotel Iberostar Varadero is a luxury beach hotel standing on Varadero Beach, set against a lush tropical landscape. Featuring a range of top-quality amenities, it is situated just 50km from Varadero Airport and 14 km outside the city centre, while Havana is 150km away. The 5-star Iberostar Varadero Hotel is divided into 11 buildings that house a total of 386 rooms, including doubles, junior suites and two presidential suites. All rooms have a full en-suite bathroom with a hairdryer and magnifying mirror, as well as room service, telephone, satellite television, air conditioning, mini bar, CD player, coffee machine, ironing board and safe. The Iberostar Varadero features a Wellness Spa offering an array of beauty treatments, as well as sports facilities at no extra charge. Without leaving the hotel, guests can enjoy aerobics classes, archery, basketball, beach volleyball, dance lessons, football, kayaking and tennis. There are also three swimming pools to lounge beside, plus a children's pool and a Jacuzzi. The Iberostar Varadero offers a wide choice of restaurants serving the finest local and international dishes. Guests can choose between the buffet service in the main restaurant, featuring live cooking, or three themed restaurants. There's also a choice of venues for private dining, as well as drinks and snacks served at the pool and beach bars. A big thank you to Morgan who has been helping me book flights for my parents. I even recommended a friend of a friend because of their good customer service. A great trip and very well organised. Fantastic service, really helpful travel manager. Made booking very easy and straightforward! Flight, transfers, hotel all brilliant. Why couldn't you arrange the weather as well - we had some rain?